Winter isn’t coming any longer; it’s already here. But just because the fluffy stuff is flying doesn’t mean you need to hunker down indoors. Snowshoeing is a great family-friendly activity that allows you to include even the littlest of the littles. Of course, ensuring everyone is warm and dry is imperative for a fun day outside, and that takes some work—and the proper gear. Below, I’ve included my favorite toddler snowshoeing gear that comes from experience with our daughter, Liliana. At 15 months, she isn’t quite ready to ‘shoe on her own, but girlfriend has spent plenty of time in the snowy wilds of Colorado’s backcountry, as well as one wintry excursion to our northerly neighbor, Iceland. If this gear kept her warm during a five hour snowshoe in 15 degree weather with a blustery blizzard, I’m willing to bet it will do the same for your child too. Note: If your child isn’t ready to snowshoe on her own, take a look at our roundup of my favorite kid carriers! The Gotland also features great details that add value to the purchase. An insulated seat means your child’s bootie stays warm when he sits and plays in the snow for extended periods of time. 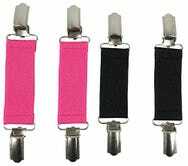 Detachable silicone foot loops wrap underneath snow boots to prevent pant legs from riding up in deep snow. 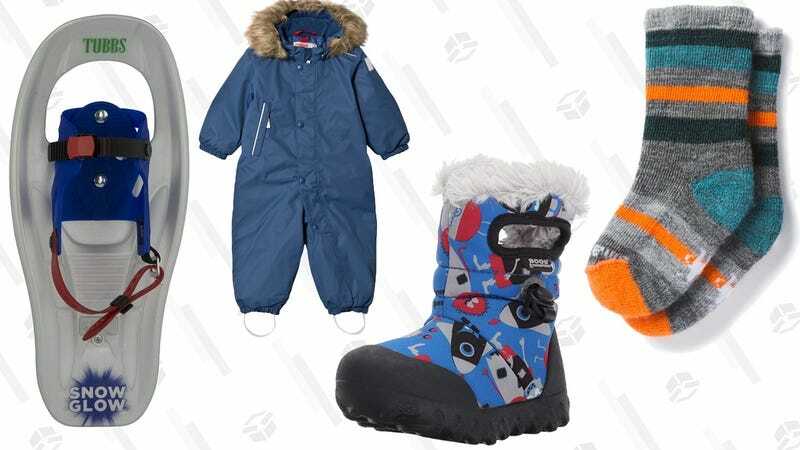 And, Reima takes insane toddler growth into account: each size adds an extra inch or two so that you know your purchase will fit your child for the entire winter season—at least. Sure, the snowsuit comes with a hood but I’ve found it best to plop a beanie on Liliana’s head to ensure she stays toasty throughout the day. One of my favorites is the Tiny Bear by Columbia Sportswear. It’s has adorable little ears which are practically a requirement on my kid’s noggin (duh), but it also sports a convenient slip-through adjustable chin strap. This means that your child can’t pull it off his head and you’ve got a little bit of room to grow. Yes, we’re back to Reima again but I can’t help it; they just get kids’ outerwear. On super cold days when I want to add a warm layer beneath Liliana’s snowsuit, I reach for the Parvin. This one-piece is made from wool with a brushed fleece interior for extra next-to-skin softness that regulates heat. A full-length zip means diaper changes aren’t a total battle but the soft chin guard ensures the sharp zipper doesn’t aggravate sensitive baby skin. I totally get it: it seems outrageous to spend $20 on two pairs of kiddo socks. But hear me out. The old adage that “cotton kills” is the truth and the last thing you want is a pair of soaking wet socks sitting on your child’s feet, radiating cold throughout his body. Snag your child a couple pairs of wool socks and play happy knowing that they dry fast and breathe well so your baby won’t be stuck with bricks of ice in place of toes. Speaking of feet, let’s talk about the best way to keep your child’s tootsies warm: waterproof, insulated boots. The Bogs B-Moc boots are 100% waterproof and are rated warm down to -4 degrees Fahrenheit meaning you won’t need to worry about chilly toes. A drawstring cinches around the ankle for a secure fit and as an added bonus, keeps errant snow out. One caveat: without any type of rear entry, some parents (like me) struggle to pull these suckers onto their child’s feet. But then again, it could be user error because my husband accomplishes the task in less than 10 seconds. For your toddler, I highly suggest scrapping the notion of gloves and heading directly to mittens. The Adrenaline Mitts are a great option thanks to the zipper than runs up the back of the hand. Once it is unzipped, it’s easily to slide your child’s wriggling hand inside (which any parent knows is a feat in itself). A longer elasticized cuff means snow stays out and it’s easy to tuck underneath a jacket sleeve. Let’s be real: the Adrenaline Mitts wouldn’t be anything without mitten clips! Toddlers have an uncanny ability to lose mittens, and on the trail is no exception. Save yourself the hassle (and your child the chilly hands) and invest in some clips. With teeth at both ends, it’s super easy to clip one side to the mitten and the other to the jacket sleeve, ensuring you’ll never lose a mitten again. Tubbs claims that everything is more fun with flashing lights and I couldn’t agree more. If your kid is old enough to manage snowshoes, why not snag her a pair that light up with each step? Thanks to the QuickLock bindings, these are easy to snap onto moving toddler feet: one buckle on top of the foot and a second strap around the heel. Sure, they aren’t the best performing snowshoes on the market, but your four-year-old probably doesn’t need to worry about a heel lift or lateral traction. I suspect she’d rather focus on the captivating LED lights that glimmer with every step!